Julie Scoullar from Sue Ryder Dee View Court in Kincorth. The success of a scheme set up to help people with neurological conditions live at home will be celebrated today. 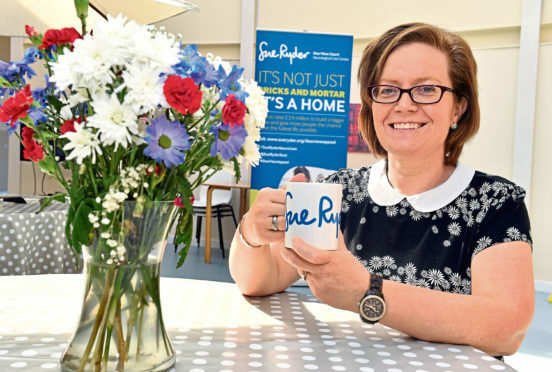 Sue Ryder launched its self-management service three years ago, which has already helped more than 240 people affected by conditions such as Huntington’s disease, severe stroke and Parkinson’s disease. The initiative equips people with the tools, skills and long-term support they need to manage their own health and well-being at home. And, although many of the people who have been referred to the service require assistance to access activities and might suffer from additional effects such as social isolation and loneliness, the scheme has been hailed across the region. Julie Scoullar, a clinical nurse specialist, works at Dee View Court in Aberdeen and has been a driving force of the project. She said: “We work with people in their own homes and out and in the community. On the self-management programme, every person chooses a goal to achieve that’s personal to them. “This might be to reconnect with their communities, access activities to improve their physical health, meet new people, live more independently or feel informed about their condition and the support that’s available to them. “Our small team of a clinical nurse specialist, senior support workers and our administrator have provided information, advice, emotional support, confidence building and practical assistance. “We have also supported over 70 carers by offering information and advice, and sometimes a short break away from their caring role. “Along the way, we have helped people to go along to seated exercise classes, join health walks, try photography classes, practice walking in their local area, join a lunch club, or join a specialist support group. Feedback suggests 95% of people who have used the service have felt their general well-being has improved, with 89% believing they are more in touch with their community. But, while the group will enjoy their lunch at Kincorth Sports Centre this afternoon, Mrs Scoullar recognises the need to keep highlighting Dee View Court’s expansion appeal. She said: “We need to raise £3.9 million to build an extension and provide much-needed services for people with neurological conditions in Scotland.